The Strata Tour Ace utilizes patented 4 Piece Multi-Layer Technology and a high coverage dimple pattern for staggering distance. The Urethane cover is engineered for "One Hop and Stop" spin around the green. 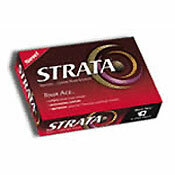 The Strata Tour Ace is your Ace in the hole. Still my favorite ball ever. Its unfortunate that it is out of production, it always performs great. I stocked up a few years back and I have enough to last me a couple more golf seasons. These companies come out with a good product that people enjoy and then they stop making the ball. Maxfli also does this alot, I like Maxfli balls alot but they constantly discontinue there line. BEST BALL EVER MADE PERIOD!!!!!!!! May seem silly reviewing a ball that has now become extinct, but this is an outstanding ball and great value. If your fortunate to find them (usually at huge discount prices), you won't be disappointed. Durability has been very good for me, providing your not blasting trees or spinning it off cartpaths. I have played the Strata TL balls but they don't play like the Tour Ace. I look for deals on premium golf balls as it's hard to cough up $40 dollars for a dozen golf balls. I found these new for $15.00 a dozen and bought what they had at MC Sports. I have purchased some AAAA balls on Ebay and have been pleased as well. What I have learned is that you can own really nice equipment, but if your playing a golf ball that is marginal, your score will suffer, no matter how good a swing you put on it. I think many balls play too hard which really can affect chiping and putting touch. I have tried noodles and some lower compression balls out of curiosity, but I get little or no feedback as to how I hit them. Seriously, I took a drop on a par 3 that I hit solid using a noodle and couldn't find. Later found it beyond the hole by the next tee box. Like hitting a superball. Gave the remaining dozen including the one I found again to a buddy who goes thru balls like water. The Tour Ace has amazing distance and putts true with a soft-firmer feel. It has great spin allowing you to back up the ball with your wedge. I have stopped it next to the pin after one hop. Times that I have won longest drive or closest too the pin, the last couple of years, it's been with a Tour Ace. I really like the Pro V1, HX Tour and Nike ONE which are also outstanding balls, but you have to pay full price for these. So many great balls these days. After my Tour Ace balls are gone, I'll be using the Precept U-Tri Tour which I bought a bunch of, and is another amazing discounted golf ball. good ball, but beware if you spin your wedges, this ball can spin the ball too much sometimes. backed 1 up yesterday 25 feet, problem is it was a back pin, had a 60 foot putt bcause of that. I waited a while before reviewing this one. My first impression was great, but I thought it would slide. It didn't! The ball is very long, spins very well, but is a little 'clicky'. Not harder then say a ProV1, just 'clicky'. You can tell the mantle is very firm, but the core has a soft feel. Even in the rain I backed up a 1/2 wedge shot to within 8" of the cup. Durability is better than most Strata balls. I'm pretty satisfied even though I lost 8 in Las Vegas. That's not all I lost in Vegas, so I'm OK with it!! what can i say.. the ace is sweet off of the tee, and when they say it's the one hop and stop ball, well it's nothing short of that.. overall great.. This ball is long. I played a Titleist Pro V1 along side of a Strata Tour Ace and the Tour Ace was longer by 10 yards. It has an excellent sound and feel off of my driver and irons. The only thing that I would take off points for is the durability and the feel when putting. It gets scuffed pretty easy. Also, it does have a firmer feel while putting than the Pro V1. I think it is harder to judge the distance and keep a consistent roll on the ball than the Pro V1. Overall, it is an excellent ball and for the price that I got them for, I would play them every day over the Pro V1. Pro V1, Strata, DT solo, HP tour, everything else. The strata tour ace is by far a better ball over the ProV1 in my opinion, its been proven longer and gets far more spin too. The distance and feel conbined makes for a wonderful playing golf ball. The durability side is Okay, but thats not a factor in my mind as to what makes it a better ball, it can last a full round. Used to play the Pro V1 but can't afford it any more. I was able to pickup the Tour Ace for roughly $23.00/dozen on ebay. I like the ball. Does scuff somewhat but not as bad some might lead you to believe. Distance comparable to Pro V1. Holds the line well off driver, low spin. Drops and stops on short irons. Shot two consecutive 78's with this ball. First time ever to break 80 twice in a row. Absolutely nowhere near worth the money. It has pretty good feel but this ball scuffs and gets bad scratches on it very easily. It has decent spin but not great and isn't great in the wind like the Hogan Apex Tour or Callaway HX. It is the same distance as premium golf balls but not at all durable. You've gotta switch balls like every 3 holes because it scuffs so badly. Don't waste you money on these.